Why use radial farm tractor tires? Better Traction, Increased Fuel Efficiency, Less Compaction, Longer Tread Life and a Smoother Ride. Pete's Tire Barns carries high quality radial farm tractor tires from BKT, Firestone, Michelin, Nokian and more. Browse our selection of radial farm tractor tires for all different types and sizes of tractors and farm equipment. It does not matter if you use your tractor for farming, mowing, snow removal, site work or forestry, radial tractor tires will improve your ride, increase your comfort, last longer and be more fuel efficient. The Firestone Destination Farm radial implement tire features Firestone's revolutionary AD2 technology for enhanced performance over standard radial farm tires. The Agrimax RT855 from BKT is a radial tractor tire that was designed to provide high load carrying capacity and excellent floatation properties. The Rib 713 from BKT is a radial farm implement tire featuring steel belted construction. Designed for modern farming the Rib 713 features reduced soil compaction by carrying heavier loads using lower air pressures. 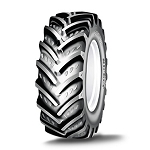 The Kleber Super 8L radial tractor tire was specially designed for vineyard and small orchard farming applications. The Kleber Super Vigne radial tractor tire was specially designed for vineyard and small orchard farming applications. The Firestone Radial 4000 tractor tire features a reinforced sidewall and bead construction for excellent stability on hilly terrain.